Just when you thought coffee trends couldn’t get any crazier, enter the broccoli latte. 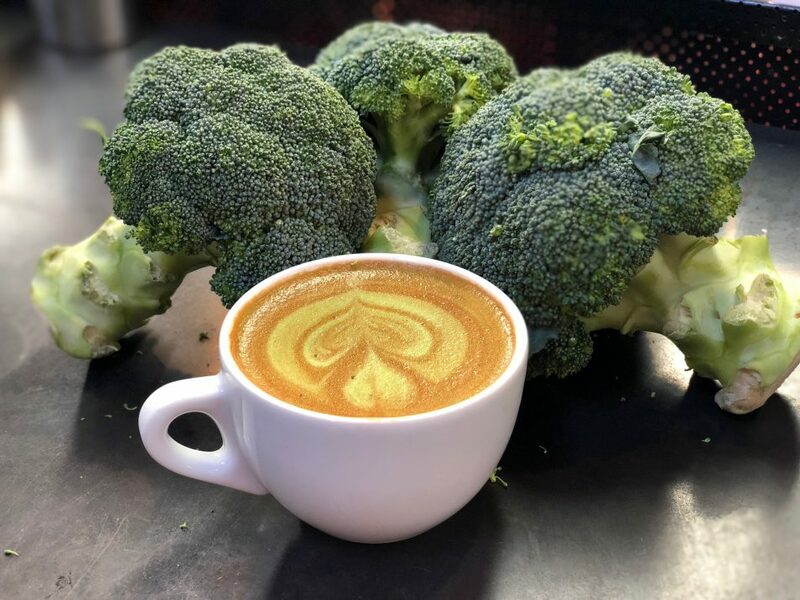 You’ve heard of turmeric lattes and even a coffee served in an avocado, but is the broccoli latte the next product to hit the tables of your local hipster café? We’re here to tell you, it’s possible. You might be asking why we would even suggest such an outrageous concept but it could actually help address two very real challenges our society is facing: food loss and poor diets. With almost two in three Australian adults overweight or obese, being healthy, and eating a healthy diet, is a huge focus for many of us. But despite the increasing popularity of ‘superfoods’ and health and wellness, Australian diets are still poor. Our research shows the average Australian is still not eating the recommended daily intake of vegetables a day. And we know it can be hard to get those five serves of veg everyday while also trying to drink enough water, getting in your 30 minutes of daily exercise and doing all of the other things you have to do. So, we’re trying to make it easier to squeeze in a couple of extra veggies, especially if you have fussy kids who don’t fall for the ‘they’re cute little trees’ line. Over one-third of all food produced globally is lost or wasted. In Australian households alone, 4 million tonnes of food is wasted every year. All of the food we waste takes water and energy to produce, transport, prepare and sell. And all these resources are wasted when we throw food in the bin. Waste occurs all the way along the chain from farms to supermarkets and households. But we can help reduce food loss on farms and create a new revenue stream for farmers at the same time. On a broccoli farm, the heads are usually separated from the leaves and stalks, which are ploughed in as a fertiliser replacement. Unsexy, or ugly, broccoli too won’t make the cut. That’s why we’re looking at new and creative ways to use produce from the farm. With funding from vegetable growers through Hort Innovation, we’ve developed a broccoli powder that could help pack extra veggies into your diet. The 100 per cent broccoli powder is made from whole broccoli, and produced using a combination of selected pre-treatment and drying processes to retain the natural colour, flavour and nutrient composition of fresh broccoli. Broccoli contains protein, fibre and health-promoting bioactive phytochemicals, making it an ideal candidate for being turned into a powder ingredient. The powder packs a healthy punch with approximately one serve of your five a day vegetables in every two tablespoons of powder. While broccoli lattes might not take off, the powder could be used for smoothies, dips, soups and baking. In fact, we’ve already used it to make extruded ‘Twistie-like’ snacks with high vegetable content. We’ve tested this with parents and even kids who thought they were a pretty tasty way to help bump up their veggie intake. The broccoli powder is being developed as part of a larger research and development project which aims to reduce vegetable loss by creating healthy food products from ‘ugly’ produce or produce or produce that otherwise doesn’t make it to the market. The next steps are to take the powder into further product development and consumer sensory evaluation trials to see if it’s a product you might actually see on the supermarket shelves or in your coffee cup. While broccoli lattes aren’t available at your local cafe just yet, we’re seeking partners to help commercialise a range of food products with broccoli powder. Get in touch if you’d like to learn more about doing business with us..
We’re working on the next generation of healthy food products. Fantastic idea for those struggling to get those extra nutrients. Mix it into burgers and don’t tell the kids! I think this is a great idea and I’d like to try some as soon as possible. Any information on where and when we can get it would be much appreciated. Sorry to say, Shannon, but it’s not commercially available just yet, but we and our partners are working on it and hopefully it will be available in a range of food products soon.